The best new deck stain on the market is the Restore-A-Deck wood stain. We base this decision not only from the ease of application and convenience, that this is also can be applied the same day as the prep. After a year enduring this brutal winter, we have evaluated our decks and their deck stains for longevity. 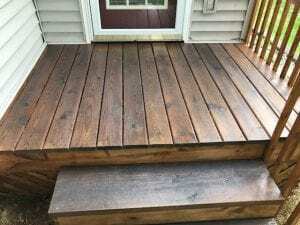 Restore-A-Deck has held up to its promise to stay true to its original application color and quality through the last year. We will continue to monitor the progress of this newer stain and post results as needed. What is the best solid color deck stain to use on a redwood deck that has already been stained with a solid color deck stain. Some areas still have the solid color deck stain in good shape so we do not want to totally strip the deck. The ends of some boards are cracked from water and sun exposure. What should we use to fill the cracks before re-staining? This is for a deck in Denver Colorado that is 25 years old. Do not use crack filler on outside decks. It does not work very well. Just leave as is. We like the Flood Solid Stains. Hi, and thanks for extremely informative site! I am installing a T/G Western red cedar fence next month (Oct) by which time it will be raining here in the PNW. I have the 1×6″ boards which are kiln dried, milled on one side and rough sawn on the other. I realize I cannot stain the milled side until after weathering. By then it will still be wet here and will wait until next June. However, can I go ahead and treat the rough sawn side (northern exposure) now with Woodrich Timber Oil before fence installation? Then in June clean and brighten the milled side and use the Timber Oil again. Make sense? No. Do it all at once in the Spring. No need to do one side now and it will be extremely difficult to not have the stain bleed over on to the other side. 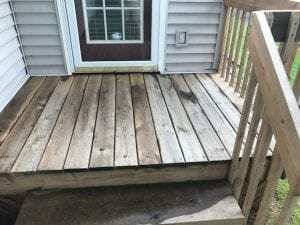 What is the difference between a Deck stain and a sealer?? Which is best on Pressure treated wood. Treated pine deck, 12 months old. Atlanta suburb. 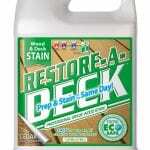 Will clean and brighten with Restore-A-Deck products. Am looking for a stain that is not gold or red, and not too dark. Just a simple medium brown would be great. I like Restore-A-Deck Dark Walnut on my sample board, but thought it would be darker, so almost didn’t apply to the sample board. Any other suggestions? Armstrong Clark and TWP 100 samples I’ve tried don’t seem to have the right color tone. Thank you for any suggestions! I have learned a lot from your site. The Dark Walnut should work if you like that color on your wood. Not many other medium brown options out there. We cleaned and brightened our deck 3 weeks ago and then put up the wood as a fence. We thought we were going to stain right away but were unable to stain it at the time. We will be staining in the next week or two. Is it ok to apply a stain like this one (or Defy) without cleaning again? That prep work took a Really long time. Can we just dust off with a rag now for a quick cleaning? Or is any of that necessary? Should we hose it down prior to staining? You will need to lightly wash (rinse) the wood again and then brighten if it has been this long since you did the prep. Should not take very long. Ok, so we only need to order the brightener and not the actual cleaner? Thank you! Thanks. Can you please comment on the difference in color between the Defy Natural Pine and the Restore-A-Deck Natural? You said the RAD Natural would look a little darker than the boards wet, with a more golden tone. How would you describe the Defy Natural Pine in comparison? Wood is rough sewn redwood. Thanks! Similar in colors but not exact. Hard to say as it always varies based on your wood type and age. Thank you. How do you read the “Consumer Star Rating” on your site? It’s not allowing me to click on them. I’m having a tough time deciding between defy and RAD and would like to read the consumer reviews. Thanks again. It only shows the average of all ratings. 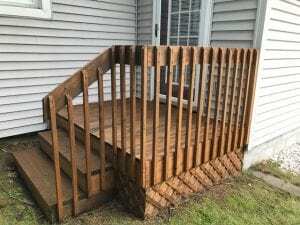 Can you buy Restore a deck stain in Canada, if so where? Would this product be recommended for a pier that was pressure washed at too great of a pressure and seemed to destroy the color and protection of the pressure treated lumber ? If so, what pre-treatment would be needed ? Light sanding ? You can use it on all exterior wood. Light buffing of the floor to remove any splinters.